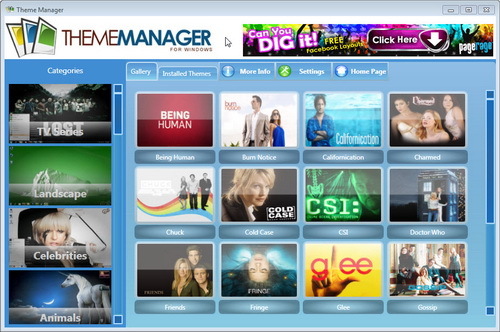 Windows 7 Theme Manager is an amazing free program for Windows 7. With this program you can access to 100 or more high quality themes for Windows 7 directly from your desktop. You can browse all the themes and install it easily. To further make it easier for the users, every theme is categorized. The theme collection for Windows 7 will always be updated via internet everytime you run this program. The installation process is also easy only with a simple click it will be attached to your desktop automatically. Each theme that is installed will also be categorized or easy managing and deleting.